Belize’s most inhabited and lively Caye by far is San Pedro. Loved by all who visit, “La Isla Bonita” is truly reminiscent of the Eastern Caribbean while retaining the charm and beauty that is Belize. Ambergris Caye is the largest of the Belizean Cayes and has been the hub of the Belizean maritime trade for centuries. San Pedro is the only town on this island and now has over 4000 residents, mainly Mexican descendants. The town is colourful with brightly painted houses, shops, internet cafés, and numerous hotels. San Pedro offers a lively nightlife of bars, restaurants and a few nightclubs. If you are looking for a friendly local beach bar then go to BC’s for cocktails and beers, or try their Sunday afternoon BBQ while you listen to the live band on the beach. There are many good restaurants in San Pedro, a favourite with charterers is the Blue Water Grill. The menu offers a great variety of spicy and traditional foods, with good steak and well prepared fresh fish and lobster, you really can't go wrong. The island also boasts beautiful fine sandy beaches laced with palm trees and crystal clear turquoise waters. The barrier reef protects the waters from the ocean swell and currents ensuring beautiful sailing conditions and a calm anchorage. There are numerous docks that will fulfill all your water sporting requirements from windsurfers, diving, kayaking and kite boarding. Visiting Hol Chan Marine Reserve or Shark Ray Alley you will see some of Belize’s amazing marine life, such as nurse sharks and huge rays. Hire a golf cart or a bicycle which are the islands main forms of transport or if you prefer to take a stroll everything is in walking distance. Everyone is friendly and very laid back, dress is casual, shorts and T-shirts are the norm. San Pedro is the popular choice for starting your charter and provisioning and supplies are readily available at the local supermarket and grocery stores. If you need to exchange money the Belize Bank and Atlantic Bank offer international facilities. A popular stop-off to and from San Pedro, with its large sheltered bay the anchorage in the lee of the island is very popular. A short dinghy ride will take you ashore where you can explore this small limestone coral island and pick up any forgotten items of provisioning for your journey further south. Despite the growth in tourism Caye Caulker has remained a small village with almost all the businesses being locally owned. The best way to get around is on foot as the island is small but Golf Carts are used as the main form of transport on the island. If you are looking for a great restaurant try Don Corleone’s, the most elegant restaurant on the island. There is an airport here should a ‘late arrival’ need to catch you up! This tropical island of 275acres boasts an exclusive luxury resort with a superb 18 hole championship golf course, swimming pool complex, luxury villas, bar and restaurant. Island and Marina Facilities are available to visiting yachts for a fee but should be arranged in advance to avoid disappointment. Although privately owned you can anchor as a stop-off along the west side of this caye. The Battle of St. George’s Caye makes this a Historic caye for Belize. The battle was between the English and the Spanish over the territory of Belize. The battle lasted 7 days and ended on the 10th of September 1798. This day is now marked as a Belizean national holiday. Today the Caye still has a British army training centre on it & two resorts. Many of the more affluent Belizeans and foreigner’s homes are here. Once you have anchored your yacht here, feel free to go into the resorts and have a drink in the bar, or a meal at the resort restaurants. This tiny, 1.2 acre picture Postcard Island has a beautiful sandy beach and several palm trees. Sitting right on the edge of the barrier reef it is excellent for snorkelling and fishing. You will find many lobster, conch and sea turtles in this area. Take a short dinghy ride to the beach and enjoy a picnic under the shaded thatch huts that are on the island. It also marks the entrance to the largest cut in the reef and cruise ships and tankers can be seen entering and leaving for Belize City. Small but beautiful, this Island is home to the only operational lighthouse in the area. Be sure to stop, go ashore and meet the lighthouse keeper and his family who are always happy to receive visitors. He’ll point you in the direction of some excellent snorkelling to be found near the island. With a pristine beach, huge coconut palms and crystal clear turquoise waters, Rendezvous is truly a jewel in this chain of cayes. With vibrant reef formations this underwater delight is full of colourful coral, sea fans, fish and manta rays. Relax on the beach, soak up the warm sun or have a refreshing drink on your yacht in this tropical paradise. When approaching and leaving the island great caution is needed as there are many coral heads. Timing is everything as Belize city tour boats bring guests to this island. A large mangrove caye, that is home to a massive variety of birds, and other marine life. Be sure to take along a kayak and go exploring through the many tiny waterways winding their way through this caye. Space is tight and there are mangrove roots hidden just beneath the waters surface so do not attempt this in your dinghy. Keep your eyes open as you might well see a manatee. You can anchor on all sides of this cay but the north side is most interesting. Ensure your anchors are properly set as turtle grass lines the sea bed. 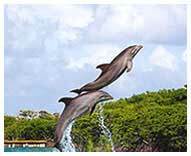 By prior arrangement it may be possible to stop at the Dolphin Encounter Programme at Hugh Parkey’s Dolphin Experience on Spanish Lookout Caye. The Dolphin Encounter program promotes a fun, safe and educational interaction with resident dolphins, encouraging a greater understanding of these magnificent mammals and hopefully encouraging you to take a more active role in marine conservation. 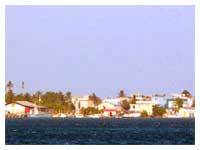 As you venture further south you will come upon several cayes that have lagoons in the middle. Sheltered and excellent protection for stronger conditions these cayes are typically home to a variety of birds, wildlife, manatees and other marine life. Anchoring in these lagoons can be an amazing experience with islands all around you and only in a few feet of water. Be sure you are anchored a little way from the mangroves as sand flies and mosquitos can make thing a little uncomfortable if there is no wind. Small patches of coral offer good snorkelling and this protected anchorage makes a great overnight stop. You can also explore a small lagoon by dinghy and may possibly see manatees. 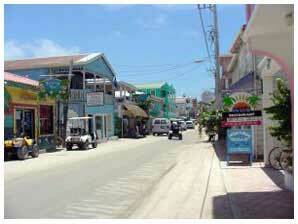 Tobacco caye has two restaurants and bars and is a favourite for divers. The reef around the island is an excellent place to snorkel with a small cut bringing in a huge variety of marine life, snappers, tarpon, rays, & sharks to name but a few. This beautiful caye has a really relaxed and welcoming feel to it. Drop anchor in the small patches of sand just to the west of the island and you can swim or snorkel from the yacht or dinghy ashore and explore the small but pretty cay. Running south between Tobacco and South water cay you can follow the reef as a dark blue line of deeper water, edged with bright yellows and crashing reef mark your path like a highway in the ocean. Stunningly beautiful sailing! Southwater cay is a beautiful tropical island sat on the barrier reef at a mid way point between the northern and southern Belizean cays. Home to International Zoological Expeditions (IZE), Blue Marlin Lodge and the Pelican Resort , South Water cay is a favourite stop off for charter guests. Mac and Jennifer run IZE, a marine biology centre and are always pleased to receive visitors to the Island. They offer a small bar and basic but quaint restaurant, once you have anchored be sure to inform them if you will be eating at IZE as they will need time to prepare. You can anchor in the small but well protected bay on the west side of the island, aim for a small patch of sand that practically shines like a target amongst the turtle grass. 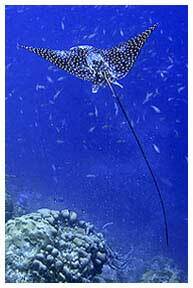 You may see spotted eagle rays circling the boat, and the island plays host to a massive population of bone fish. Bone fishing can be arranged on the island. There are also cabanas available, water, and sometimes ice, you may also be able to procure essential provisions here, but obviously they’ll be at a cost. As the name suggests this caye is home to a natural lagoon. The whole island forms a horseshoe shape circling around from the NE, with a shallow sand-bar at the SW end sealing off the entry for yachts into the lagoon, but nothing stopping exploration on your dinghy. A safe, well protected anchorage with small patches of corals for snorkelling and a good chance of seeing a variety of marine life such as smaller nurse sharks, rays and manatees. Known by the locals as Silk Cayes this trio of beautiful deserted tropical islands are untouched and well protected, offering the very best in diving and snorkelling. You can snorkel either side of the reef and be guaranteed to see amazing marine life. The Islands themselves are beautiful beaches and palm trees. The anchorage is not recommended as an overnight stop unless the weather is very settled. If the park warden is available he will help you decide where to go. Another picture postcard tropical island with a well kept powdery sand beach, scattered palm trees and small cabanas. The surrounding reef offers amazing snorkelling and you can see huge spotted eagle rays swimming gracefully around your yacht at anchor – an absolutely fantastic sight. Ranguana caye is owned by a resort company but is open to visiting yachts. They will charge you a fee for picking up their mooring buoys or using their facilities. There is also a restaurant and bar. There are plenty of sandy patches that you can anchor in at no charge and the island gives you good weather protection from most directions. 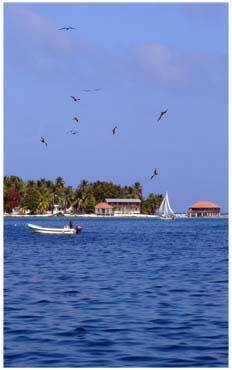 Charterers always have good things to say about this caye and the snorkelling all around it. A small but incredible pair of cayes situated on the edge of the reef. Carefully navigate your way between the islands, drop your anchor in the well protected area surrounded by reef, and nestled between the two islands themselves. Snorkelling is superb both inside and outside the reef. Go ashore and have a guided tour of a tiny resort a local has been attempting to build by hand for years. A truly surreal feeling anchored between these tiny cayes with ocean all around you stretching as far as you can see. 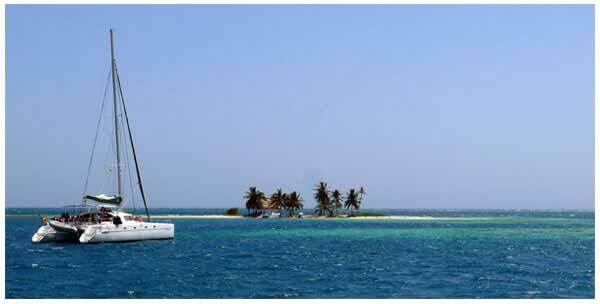 Franks Caye is a dive resort, has a bar and restaurant and is an excellent day stop for passing yachts. You can arrange a dive trip for a small fee, or explore the island. North East Sapodilla is a deserted palm tree Island with superb beaches and beautiful coral reefs. With both the interior and exterior reefs accessible by dinghy you can ensure excellent visibility and an abundance of marine life. Holding in this area is not great and so this is only recommended as a day stop. Part of the Sapodilla Chain of Cayes in Southern Belize, Nicholas Caye is a well protected and beautiful islet. Offering fantastic snorkelling, clear waters and an interesting island to explore makes Nicholas Caye a favourite stop off. Anchoring here is a pleasant experience, the sound of waves gently breaking over the reef and the fresh sea breeze gives you a tranquil and peaceful stay. Laughing Bird Caye was torn apart by a hurricane many years ago, and its reef nearly destroyed. A group of environmentalists have helped re-establish the reef here and have protected this beautiful cay. Now it thrives with diverse young marine life and smaller coral heads. This is an excellent day stop and in very settled weather you can overnight here. 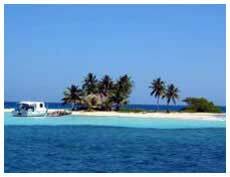 It is a superb caye to visit on your way to or from Placencia. 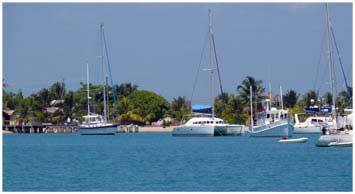 The anchorage in Placencia Bay is very large and holding is good with a muddy/clay bottom. The bay is deep and you will anchor in approximately 25 feet of water. You will see many charter and cruising boats anchored here as it is Belize’s southern starting point for a yacht charter holiday. It is advised to only use one anchor here and leave plenty of space between you and another yachts as the wind does shift around frequently. The Shell fuel dock has a dinghy dock to the side and it is free to tie up, from here it is only a few minutes walk into town.